Part security camera, part home environment monitor, this attractive box gets the job done. 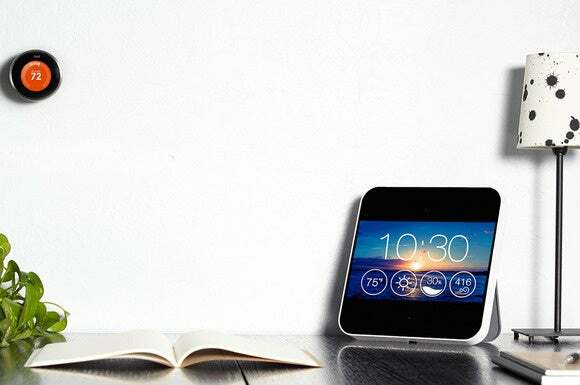 Another successfully crowd-funded connected-home product is coming to market. The Sentri is an all-in-one home-monitoring device similar to the Canary in function, but it is in some ways more capable than that product and it is decidedly different in form factor. Sentri raised nearly $400,000 on Kickstarter, against a $200,000 goal, and it will ship on November 27 (it’s available for preorder now). Like the Canary, the Sentri incorporates a Wi-Fi security camera and sensors for detecting motion and indoor air temperature, humidity, and quality. And like the Canary, the Sentri will send you alerts when the device is armed and it detects motion, and when its accelerometer indicates the Sentri is being tampered with. 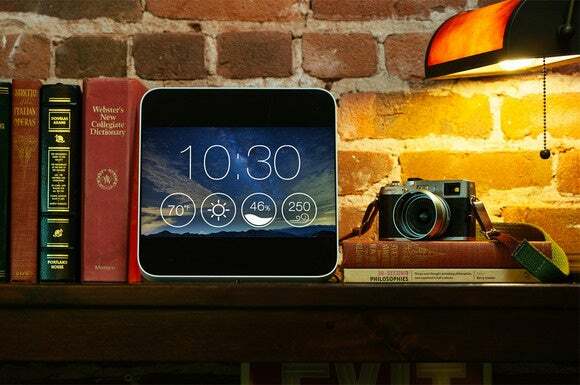 Unlike the Canary, the Sentri has a battery backup should your home suffer a power failure. But also unlike like the Canary, the Sentri has no cellular failover protection; if your Internet connection goes down, it won’t be able to send you alerts and you won’t be able to monitor its video. To be fair, that’s a feature that would likely require a small monthly subscription to support. 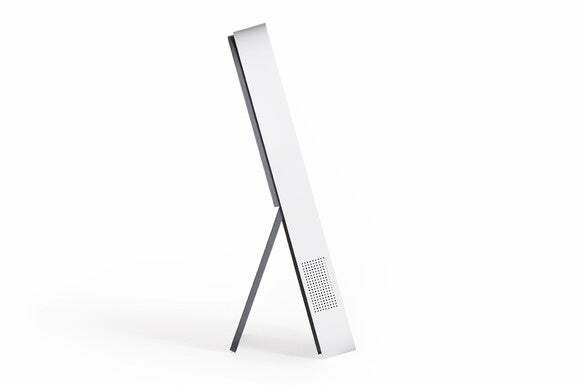 The Sentri's kickstand lets you set it up on a desktop or counter, but you can also fold that flat and hang in on a wall. The speaker grill is for a siren. The Sentri is easy enough to set up that the installation instructions are printed on one side of a 5x7 postcard (there’s a thank-you note on the opposite side). The Sentri comes in a square plastic frame and can be mounted to a wall or placed on a desk or countertop. A plastic kickstand pops out of the back for the latter scenario. Where the Canary relies solely on your smartphone for its user interface, the Sentri boasts a 10.1-inch color touchscreen in addition to its mobile client (Android and iOS are supported). 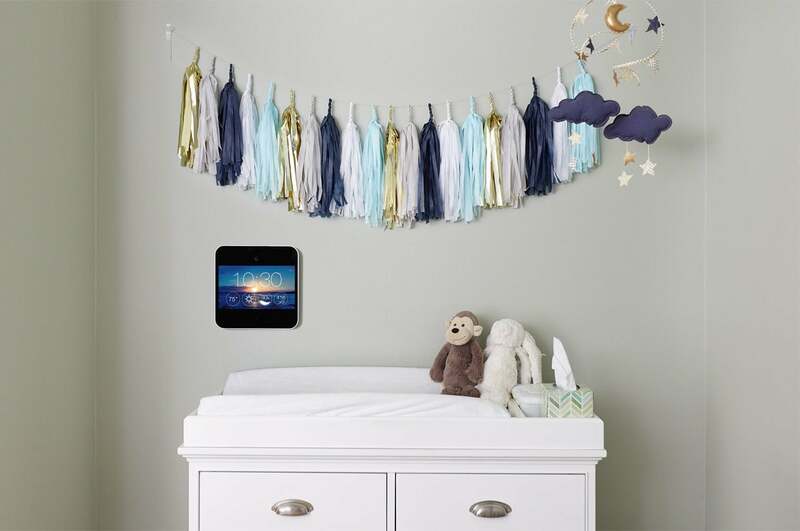 This not only helps the Sentri blend into your décor much better than either the Canary or the typical home security camera, but it also presents useful information without forcing you to pull out your smartphone. 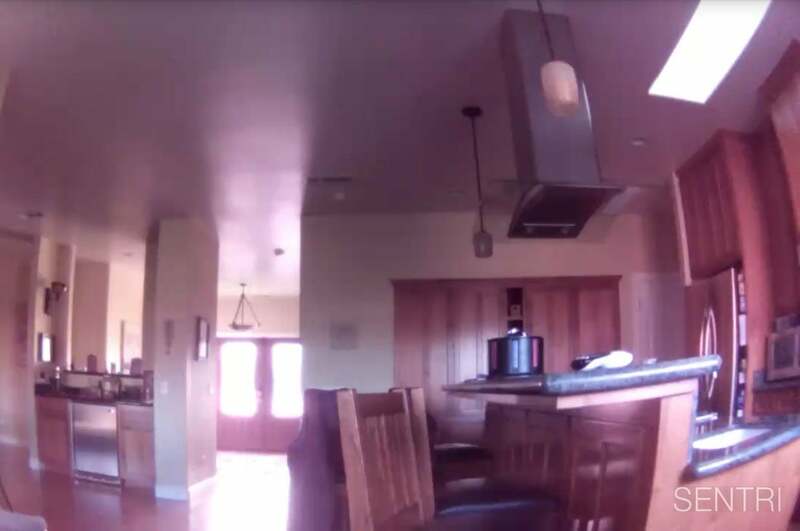 This frame was captured from video recorded in daylight. In addition to the time, displayed in very large numbers, you’re also presented with the current indoor temperature, an icon representing the current weather conditions, the humidity level, and a numerical representation of your home’s indoor air quality. On that last point, the Sentri can detect the presence of volatile organic chemicals (VOCs) and other unhealthy particulates in the air, but it won’t replace your carbon-monoxide detector. It’s also not particularly informative. It doesn’t differentiate between VOCs and cooking odors, for instance; and while it will display a chart with values over time, it simply reports any measurement below 1000 parts per million as normal, 1000 to 2000 ppm as poor, and anything over 2000 ppm as very poor. 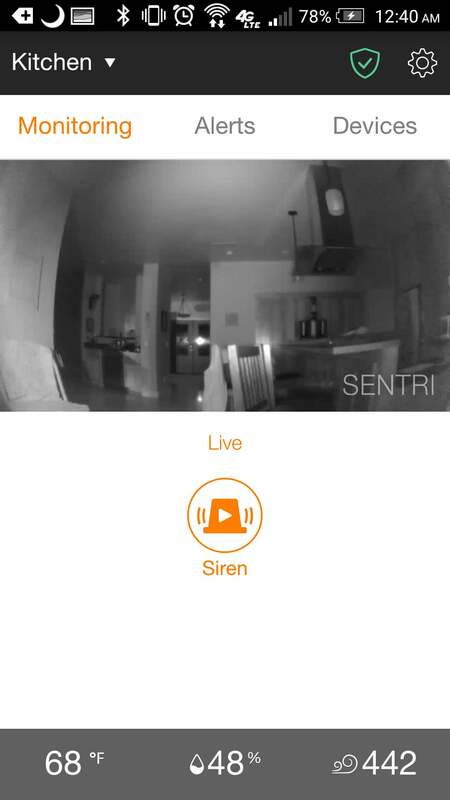 In live viewing mode, the Sentri smartphone app displays a live stream; the temperature, humidity, and air quality inside the home; and a button that can trigger a siren. You can arm and disarm the Sentri using the app or the Sentri's touchscreen. When armed and motion is detected, the Sentri’s built-in camera will capture a video clip in 720p resolution and upload it to the cloud. You can access up to 12 hours of video history, arranged in a timeline along with the related alert events, for free. It costs $10 per month to store up to seven days of video history, $20 per month to store up to 30 days, and $100 per month to store up to one year of video history (I can’t imagine a scenario where that much of an archive would be necessary, but it’s nice to know the option is there if you need it). You can view these clips in the app or on the Sentri itself, but there is no provision for downloading the video, which limits its usability as forensic evidence you can provide to the police (unless you snag it using a third-party screen-capture app). In portrait mode, you’ll see four buttons arranged beneath the video: Check Now switches to a live camera feed; Emergency Call brings up your phone’s numeric keypad (but you’re on your own to look up the local phone number for the police); False Alarm provides Sentri with feedback that helps it improve its algorithm for detecting things such as pets; and Device Control, so that you can control other smart-home devices. This last area is one where I was pretty hard on Canary. If you get an alert at night, switch to live mode, and see a prowler in your home, wouldn’t it be great if you could remotely turn on the lights to get a really good look? Night vision is all well and good, but it will never beat video captured in a well-lit room. You can monitor and control Nest Learning Thermostats, Philips Hue lights, and Belkin WeMo switches via the Sentri. A recent update enables the Canary to do that now, but only if you also have a Wink hub. A firmware update that wasn’t installed on my Sentri evaluation unit (through no fault of the Sentri team) enables the Sentri to directly control Philips Hue lights, Belkin WeMo switches, and the Nest Thermostat. You can also sound a siren blast while watching the camera’s live feed, to scare the bejesus out of anyone in the house who shouldn’t be there (the Canary has the same feature). Both systems would be even better if they could also receive signals from door and window sensors, so that a video could be recorded when a door or window opens while the camera is armed. On its website, Sentri shows several pretty pictures of the Sentri hanging on the wall, but unless you happen to have an AC outlet in the middle of your wall (unlikely), or you have an electrician put one there, your Sentri’s USB power cable will dangle like a rat’s tail. Most people will find the idea of hanging the Sentri on the wall to be impractical. If you do install an outlet in the middle of your wall, I’d recommend mounting it sideways. Break off that easel stand (the Sentri folks should have made it removable) and you can tuck the AC adapter inside the recessed compartment where the power and ethernet cables plug in, so the Sentri rests flush against the wall. The Sentri has a built-in Wi-Fi adapter, but its designers wisely provided the option of hardwiring it to your network. Should you buy a Sentri? Of the home-security products on the market today, the Canary comes closest to what the Sentri delivers. I’ve pointed several shortcomings of that device, but it does have a couple of features that the Sentri lacks. First and foremost, the Canary records video at 1080p resolution where the Sentri delivers only 720p. The Canary is also priced $50 less than the Sentri, and if you want a visual deterrent, the Canary looks much more like a security camera than the Sentri does. On the other hand, I found the Sentri’s touchscreen to be mighty useful (and I actually like that it doesn’t look like a security camera); plus, I think its ability to control third-party lighting controls is very important. So in the final analysis, I’m going to call this one a tie and let you decide which checkboxes are most important for your needs. Note: This story was updated with a frame from video recorded during daylight hours. The Sentri bests the Canary on some features (the ability to control third-party smart lighting), but falls behind it on others (video resolution is only 720p). Which features matter most to you?